Snaplock Trolley System is rated 4.2 out of 5 by 5. Rated 3 out of 5 by PhotogJP from Good for a couple months Expect to keep buying a trolley every couple months because something will inevitable break whether it be the handle, or the clamps that hold the bag. During the few workable months, it nice and works as well as expected. It's just cheaply made. Rated 4 out of 5 by Josh from Useful but flimsy This is my second trolley of the same model. ?As another reviewer stated, they fall apart after a while (my first one lasted about 5 years of fairly regular use; it lost an axle bolt and various screws on the handle that had to be replaced over time, until the contraption finally fell apart all together). That said, they are light, fold up small, and fit the Sachtler Dr. bags perfectly, saving your back. ?As such, I've bought a replacement accepting the fact they're not as durable as I'd like. Rated 5 out of 5 by MoMan from Works perfectly with camera pack I was very happy to add this to my camera bag. It's what was needed. Fits nice and snug and rolls smoothly. Rated 4 out of 5 by Anonymous from Works as Hoped For! Does what it's supposed to... snap on quick and save my back! Is this compatible with a Manfrotto SKU MB MP-BP-20BB (DSLR bag back) ? Yes, the Manfrotto Pro Backpack 20 would be compatible for use with the Sachtler Snaplock Trolley System. Is this compatible with the older Petrol Deca Bags? Specifically the PC004 ? This trolley is specific to current Petrol bags such as the SL2004. Does the base lock in place? not sure what you mean by lock in place. It does fold up when a bag is not on the dolly. When a bag is in place the base does lock as it holds the bag up. Don't think so. Maybe contact them direct. What weight will this carry safelyWhat weight will this carry safely? I used it on my bag with 50 pounds without any problem. How tall is the handle when extended? 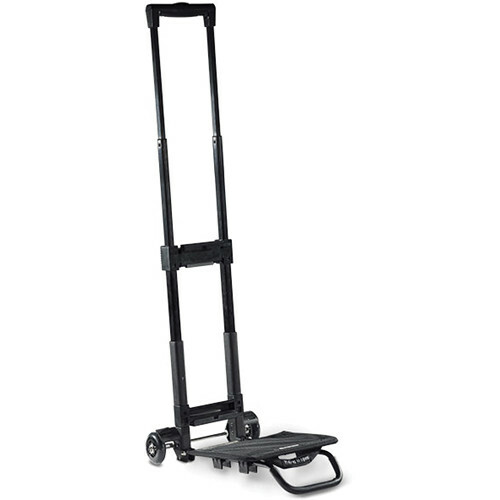 What are the dimensions of the cart when it is folded up? hello! When folded up it's pretty small 13x23 inches. Great product, lightweight.